Varieties being tried- Gold Sun, Zahidi, Red Dawn, Medjool, Honey, White Bread, Arid Gold. 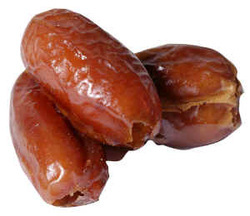 Note from C. Thornton: I've grown Medjool date palms from the seeds of very fresh dates bought at the supermarket. They take a very long time to germinate, so be patient. I planted them in pots outdoors and kept the soil moist.